The next-generation Dakton capture data system is ready to be launched. RKS, the factory qualified in the design of software systems for data capture, together with OTK Kart Group Research and Development’s department, has realized a data capture system aimed at ameliorating its go karts and competition engines’ performance. Dakton collects, analyses and converts data coming from chassis and engine in a complete manner so that such information is clear and ready for drivers and teams. This is a memorable goal for OTK Kart Group, the world’s leader manufacturer of the famous Tony Kart brands, Kosmic, Fa Kart, Exprit and Vortex, which has been supplying next-generation chassis in terms of technology, material and engineering, allowing its customers to stand out in all sporting tracks on the occasion of top-level competitions. From today, the new DAKTON data capture system represents a valid equipment for the set-up of chassis; furthermore it allows a 360° kart control, anytime, in a rapid and efficient way. 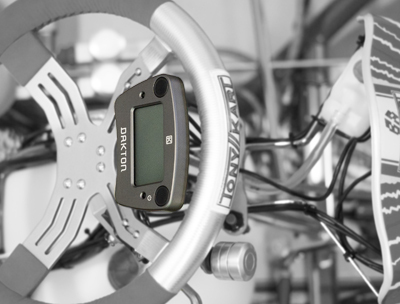 This system comes from the direct experience at the track of the Tony Kart Racing Team, which during the two past seasons, employed and tested together with its engineers, data capture systems aimed at implementing the chassis performance. This accurate and wise work comes today with a precise and efficacious system, totally adaptable to any driver’s need. Three different DAKTON systems will be available: DAKTON-XEL, DAKTON-XTRA and DAKTON-XPERT. From the base model, and the intermediate one, to the most sophisticated one: the choice is up to the type of analysis needed. We remind that the purchase of additional parts includes the upgrade, so there is no need to setup or configure the software anytime. Dakton system soon proves to come from the experience of a solid factory such as OTK Kart Group. Its compact and good shapes are the first sign proving the great knowledge of this project. This way, even before going to the track, Dakton highlights its top-level features of all its parts; this high-quality product can be easily mounted on the chassis. Once working, Dakton system does not let down and the first feeling comes along with its operation. Easy to be installed, perfect performance, immediate and clear data analysis are the must of all three Dakton models. Service. Before, during and after purchase. Purchasing one of the Dakton systems you will have the chance to have, if you wish, direct support and assistance of qualified engineers present at track. This customer service is a valid support in the first use of the Dakton system, allowing a more rapid and easy knowledge of this tool. Moreover valid assistance and valid advice lead to new and in-depth chassis operating methods.